The Model 92 movement makes use of the safety barrel, which was already being used on other Waltham movements. The safety barrel eliminates the need for the safety pinion. Both devices are a means of dissipating the abrupt release of power that occurs should the mainspring break. Without a safety device, a broken mainspring can cause damage to the movement. Power from the mainspring is first transferred to the wheel train via the center wheel pinion. In movements using the safety pinion, the center wheel pinion is threaded on the center wheel arbor and simply unscrews should the mainspring break. 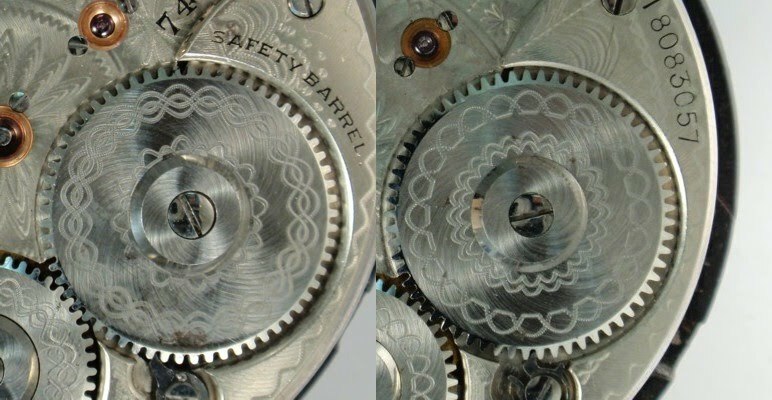 Unlike most mainspring barrels, the top and the bottom of the safety barrel do not “lock” or snap together so the momentum of a broken spring is harmlessly transferred through the barrel arbor to the ratchet wheel. The safety barrel offers an advantage in that sometimes the safety pinion “freezes up” due to corrosion. This problem can also occur if the movement was not completely disassembled in the cleaning process-the safety pinion needs to be removed when the overhaul is performed, thoroughly cleaned, and the threads should be very lightly lubricated when installed during reassembly. This is not an issue with the safety barrel. Model 92 movements will be marked “Safety Barrel” on the barrel bridge up through run 10501201-10501500. No movements have been reported from the run of Export movements just previous to this so we don’t know if these movements are marked or not.